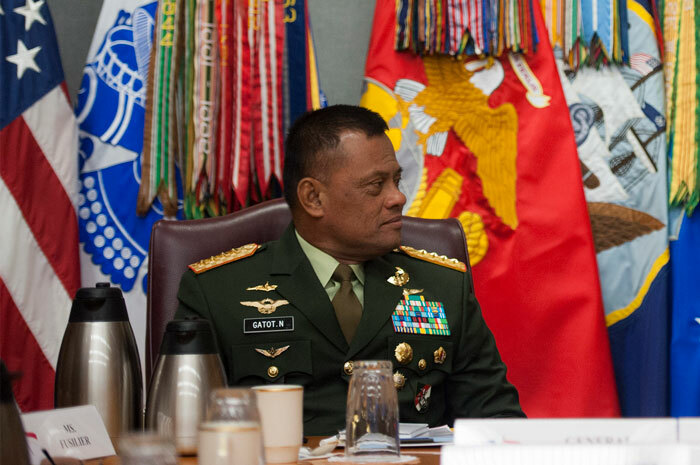 General Gatot Nurmantyo has a history of promoting conspiracy theories about foreign intervention and covert proxy wars in Indonesia. Photo by US Department of Defence on Flickr. The article “Indonesia’s Inconvenient Truths” was originally published on the Australian Outlook blog of the Australian Institute of International Affairs, on 26 January 2017. Tim Lindsey is Malcolm Smith Professor of Asian Law, Redmond Barry Distinguished Professor and Director of the Centre for Indonesian Law, Islam and Society at the Melbourne Law School. Tim is a member of the Victorian Bar and was the long-serving Chair of the Australia Indonesia Institute until 2016. His publications include Indonesia: Law and Society; Islam, Law and the State in Southeast Asia (three volumes); The Indonesian Constitution; Drugs Law and Practice in Southeast Asia; and Religion, Law and Intolerance in Indonesia. He is a founder and an executive editor of The Australian Journal of Asian Law.